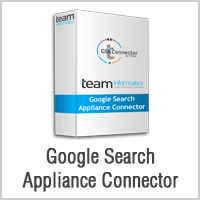 TEAM Informatics, Inc., a leading enterprise software products firm in the Oracle® WebCenter market, announces the release of version 3.1 of the Google Search Appliance® (GSA) Connector for WebCenter Content. The GSA extends the power of Google’s core search technology with its simplicity and familiar interface to corporate content across multiple servers and repositories. TEAM’s GSA Connector provides the bridge between the GSA and Oracle’s leading ECM product, WebCenter Content. TEAM has continued the Connector’s evolution in congruence with the evolution of WebCenter Content and the Google Search Appliance. The newest features provide full support for WebCenter Content Release 11.1.1.7. TEAM announces the release just prior to the Oracle WebCenter Partner Planning event in Chicago next week. This entry was posted on Wednesday, June 19th, 2013 at 11:07 am and is filed under Google Search Appliance, Oracle, TEAM Products, WebCenter Content. You can follow any responses to this entry through the RSS 2.0 feed. You can leave a response, or trackback from your own site.